As we scour the net researching for our latest article over at Jordans, this latest find, a host of reports carried out by charities and other organisations on how austerity is affecting children and families is a must read. There is a lot of data here, and you’ll need a few cups of coffee and ten dozen jammy dodgers, but it is by far the most comprehensive body of work we have come across looking at how the cuts are impacting the nation. 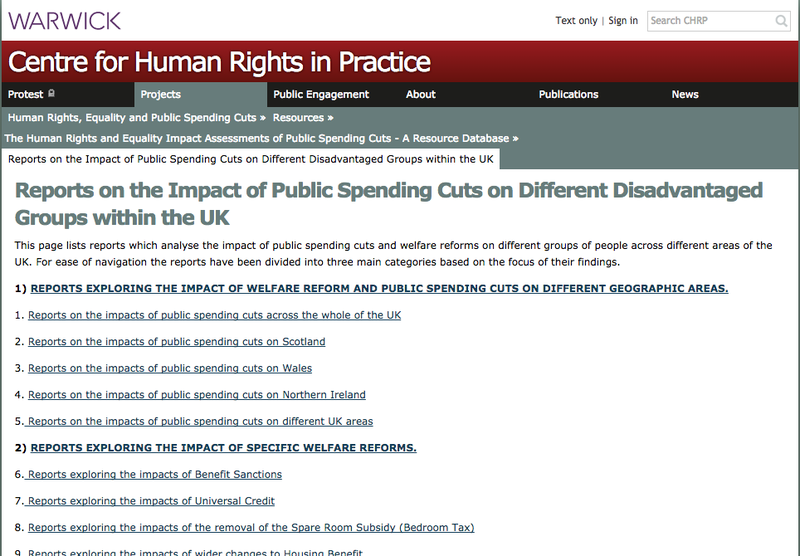 Kudos to Warwick University’s Centre For Human Rights in Practice, for producing this list. Hi Natasha, all of the talking’s and meetings and all of the multi million pound charities all doing what, earning money for them self’s to talk about nothing they know nothing off only hear say, for more then 40 years until present day I have written and told all from a ground level why we have so many people and children sleeping on the streets, do governments and charities listen of course not because then their talks would come to an end and so would the money. Please read here the email I sent yesterday to Christopher Booker and Mr Farage earlier in the year. Again in the news today there are over 100.000 kids living in poverty mostly in bed and breakfast, a lot of the blame is put onto private landlords, in some circumstances i agree. The main blame for the homelessness is with the councils and governments, going back to the early 80s i set up in Hackney hostels for the homeless people and going back to the 70s helping Saint Mungos when they first set up, so first hand i am aware of what is happening so take into account the council pays the rents directly to the tenants and for many they don’t pay, and so the council will take the tenant to court which can take up to three months, then there is the cost of the legal teams the courts all costing thousands after the case is heard by law the tenant if they have children has to be rehoused and are put into temporary BB another fiddle with back handers and here they stay until the council can find them another property, and here we go again with the rents paid directly to the tenants. In the 80s I wrote to Governments to say all rents should be paid directly to the landlords or the council, the reply was we cannot do that as this would be taking away peoples human rights and responsibility, I also wrote to Cameron last year and again to Farage on this issue only Farage office answered as reply below. To stop the homelessness they need a law for all rents to be paid directly to the landlords, then there would be no court or legal costs and a big stop to the homelessness plus the thousands of pounds paid to tenants who don’t pay their rents, one women on TV last night was being evicted because she owed over £16,000 in rent and she had 2 young kids she was thrown onto the street by the high court sheriffs but she will be put into BB then found a flat. That is an interesting suggestion, although one might foresee some administrative difficulties it has been forwarded it to our policy team. Back in the early 80s when I organised hostels for the homeless I wrote to Governments with the suggestion that council tenants rent should be paid directly to the council at the same time the government said no because it takes away peoples responsibility, I replied that for those tenants who after many months do not pay their rents they are then taken to court for none payment with then being re-housed in BB or a hostel only to be given a council house at a later date to do the same again, this is all a waste of time and money and I think it is time that people on housing benefits should have their rents paid direct to the council after all they are more or less in the same offices. If the public and Governments had worked with the homeless as I have done and witnessed all then yes we can help the people who are irresponsible to keep their homes, I hope you agree. No country can go on spending far more than it earns and getting further and further into billions of £s in debt.What alternatives do the critics suggest? Its simply the agenda of auto genocide where poor and children are first to be sacrificed. There is something amoral about our governments choices when there are 100,000 homeless kids yet £billions is paid on child protection of which a huge percentage of the kids don’t actually need! Why aren’t availiable funds not distributed to help all families? Underlying poverty is at the root of most problems.